Saturday nights were made for rock ‘n’ roll. 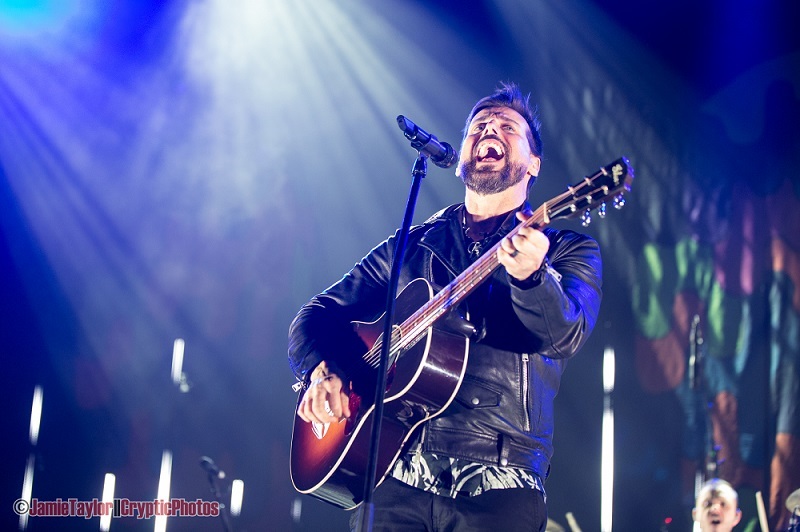 This weekend saw two Canadian legends, one in the Toronto-based rock outfit Our Lady Peace and the other in Vancouver-area rock singer-songwriter Matthew Good, perform to a near-capacity house at Abbotsford Centre, with openers Ellevator out of Hamilton, ON. The young jangly rockers Ellevator took to the stage just after seven o’clock. Band lead Nabi Sue Bersche was captivating. She stood statuesquely beneath the glow of several spotlights in her seventies-inspired ruffled shirt and high-waisted pants. The bands sound was reminiscent of Fleetwood Mac but with a more of an ethereal edge. Their set seemed to float through the air and just make you close your eyes to truly feel every note. I didn’t know anything about this group before showing up, but I can tell you I walked away begging for more. They seem to fit into that resurgence of that subtle vintage rock, in the similar vein as Sunflower Beans and Lemon Twigs. A brief moment to replenish fluids and then it was time for Mr. Good. The house lights dimmed and Matt strolled out under the veil of darkness. He stepped up to the mic stand and slung his tan acoustic Taylor around his body. A single spotlight from behind him illuminated his silhouette. He stood there staring at the crowd as a standing ovation formed before him. He started things off with a sombre and beautiful solo acoustic rendition of “Apparitions”. Just a few days earlier the musician had collapsed on stage in Edmonton, you could still feel a bit of frailty in his stance and just slightly in his voice but it didn’t prevent him from adapting and delivering something remarkably personal. Vulnerability bodes well for Matthew Good. His band joined him for the rest of the set. The production value grew as the stage and venue filled with a multitude of colourful, fast-moving lights and strobes. Matthew switched out his acoustic for a candy red Gibson electric. The energy level climbed through the set as the musicians played new songs like “Something Like A Storm” and classics like “The Future Is X-Rated”. The lead made a few small comments between songs, thanking the audience and the other bands on the bill and his crew. Matthew Good has been a mainstay in the Greater Vancouver area, so it is easy to sometimes take him for granted but this set was an important one. It felt more intimate than others. He felt more exposed and raw. It was a special experience to be a part of. There was another moment to hydrate and consume, and then it was back to my seat for one more band. Raine Maida, the band leader, walked out as blue light permeated the venue. The group started things off with “Hiding Place for Hearts”, a track from their latest offering in 2017’s Somethingness. Maida stood behind his mic and powered out the vocal work, sans-guitar. The audience rose from their seats and began clapping and singing along. It felt so familiar, like a gathering of friends at a pub belting out the lyrics to the song over the PA.
Our Lady Peace as a whole was a cohesive unit, playing solidly together. At no moment did one musician feel more important than any other, they each held their area and contributed equally, both visually and sonically. Raine’s voice rolled through the venue, clear and strong and filled with passion. The guitar work of Steve Mazur was playful but precise, you could watch him will the emotion from his guitar through the contortions in his face. The basslines of Duncan Coutts were the rhythmic DNA in each song, he stood statuesque in the shadows. The heavy drum work of Jason Pierce was the backbone, the contagious beat that got people out of their seats. He was fun to watch, an animated character in the backdrop making faces and pointing out to the crowd. The setlist was a good mix of the bands two and a half decade long career, with songs from 1994’s Naveed, 1997’s Clumsy, 1999’s Happiness… Is Not a Fish That You Can Catch, 2000’s Spiritual Machines, 2002’s Gravity, and, of course, their latest album Somethingness. The grand finale of the night was when Matthew Good and Ellevator joined Our Lady Peace on stage to close out the night. The huge group of musicians contributed to a rendition of Matt Good’s “Hello Time Bomb”, with each vocalist singing a verse and then harmonizing for the final bit. It was a beautiful way for them to end the night and to end their current tour. If you ever wondered how the musical landscape in Canada is fairing these days, this show was a helpful reminder of the overflowing talent that we possess. Get out there, see live shows, you will thank me later.